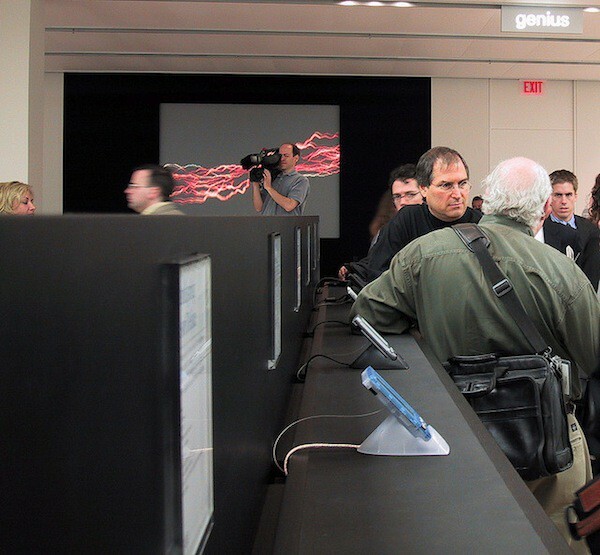 Steve Jobs shows journalist Walt Mossberg around the first Apple store. 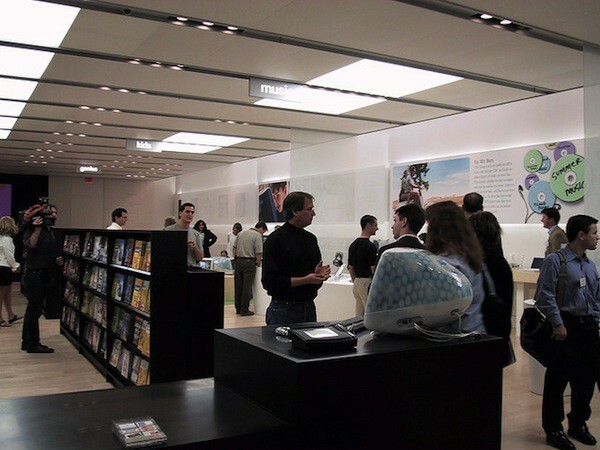 Ten years ago, the first Apple retail store opened in Tysons Corner Center, Virginia. Steve Jobs, clad in a black turtleneck and black Levis, showed journalists around the new concept store that would forever change computer retailing. What’s changed in Apple retailing over the course of a decade? Lots. Mainly that the original layout was divided into “quarters,” which included areas for home and business computers, music, kids, movies, photos and solutions, where you could make a movie or burn a CD. All of that was later re-arranged to make room for the iPod, iPhone and iPad. Also gone are the PDAs, digital camcorders and camera (check out the pic of Steve Jobs with Walt Mossberg above) and, the fact that in the beginning, no appointments were necessary for the Genius bar. One gimick that seems to have gone the wayside of those PDAs: a “hotline” or bright red phone that the genius could use to get outside help if your computing conundrum proved too difficult. Writer Joe Wilcox remembers that first store of 4,500 square feet for its clean feel – at the time he likened the hardwood floors and glass storefront to a Gap store. About 500 people lined up to visit that store when it opened doors on May 19, 2001. At the time it seemed like a huge line, now it seems like business as usual. What memories do you have of the first Apple retail store you ever set foot in?